Ideal way to present a Wine gift at Christmas with a personalised bottle jute bag. 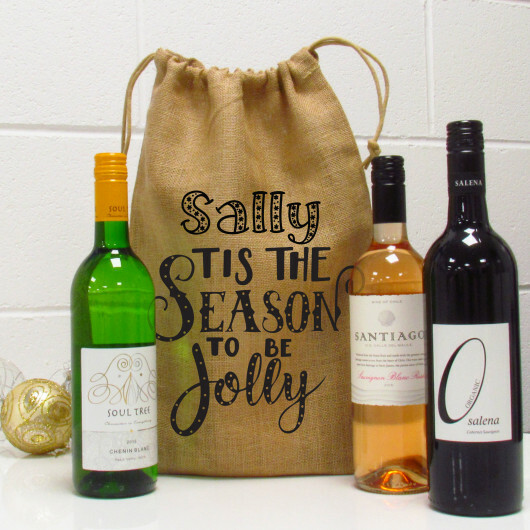 This Christmas Wine gift bag is finished with a Tis The Season To Be Jolly classic Christmas slogan. You can then choose to add a Name to the gift bag for that personalised touch. The bag can fit upto 3 bottles of wine and features a drawstring top. We also offer the upgrade for your bag to include 3 bottles of wine, these will be hand selected in house and will include a white, red and rose wine.